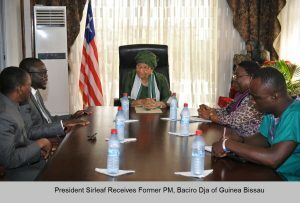 Monrovia, Liberia – Friday, December 9, 2016: President Ellen Johnson Sirleaf and Chairperson of the Authority of Heads of State and Government, on Friday, December 9 2016 received in audience the former Prime Minister of Guinea Bissau, Baciro Dja who paid a courtesy call on her at the Foreign Ministry. 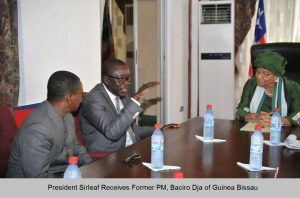 According to an Executive Mansion release, the Liberian leader was briefed by Mr. Baciro Dja in a continued efforts aimed at amicably resolving the political crisis in Guinea Bissau. 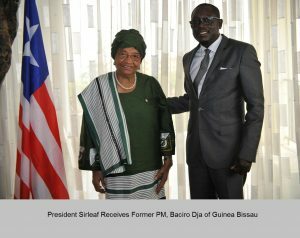 President Sirleaf thanked former Prime Minister, Baciro Dja for the visit and assured him that as current Chairperson of ECAWAS and President of Liberia, she would continue to work in the framework of peace in finding a political settlement that would benefit the people of Guinea Bissau and ensure peace and stability return to the country. 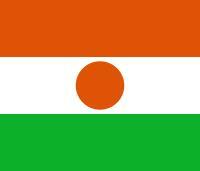 She furthered that a decision geared towards resolving the political crisis in Guinea Bissau will be made at the next ECOWAS Summit of Heads of State and Governments scheduled to take place in Abuja, Nigeria next week. 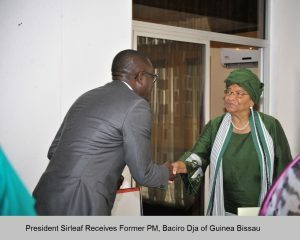 “We need to find a way to avoid instability and ensure peace and stability return to Guinea Bissau in the soonest possible time,” President Sirleaf emphasized. Speaking earlier, Mr. Baciro Dja commended President Sirleaf for the audience accorded him to find ways in resolving the political problem in Guinea Bissau and congratulated the ECOWAS Chairperson for her efforts and leadership role with a view to bringing peace to his country. He said he has explicit confidence in the ability and leadership of President Sirleaf and ECOWAS to resolve the political crisis in Guinea Bissau amid constructive engagements with all parties involved. Mr. Dja expressed the hope that ECOWAS mediation role headed by the Liberian President would continue to derive an amicable solution to the political crisis in Guinea Bissau.